I choose this winery because they make fantastic wine, very small production, and have mastered bringing back Merlot to compete with Cabernet Sauvignon and Pinot Noir as a red wine of choice. After seven years operating as “Napa Redwoods Estate” they decided to include their family name on their labels which started with the 2005 vintage. “Yates Family Vineyard” is owned by Michael and Lynn Yates, with the winery and vineyard staffed by their two daughters Whitney and Mary. Mary is running the administrating end of the business and Whitney is hands on in the winery and vineyard operations. Both are also actively promoting the wines in all of our markets. The Yates family has owned the property for more than 60 years. 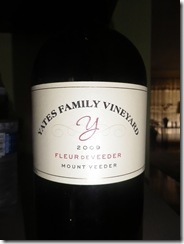 Napa Redwoods Estate-Yates Family Vineyard-Cabernet Sauvignon-Mount Veeder-California-2006-14.4% Alcohol-$50.00-A nose of dark fruits and spice, dark garnet in color. A full bodied Cab, with blackberries, black cherry, currants, smoke and vanilla on spiced finish. A delicious wine, in perfect drinking zone now. WE-92 CR-92 Good with steak, chicken, pasta. 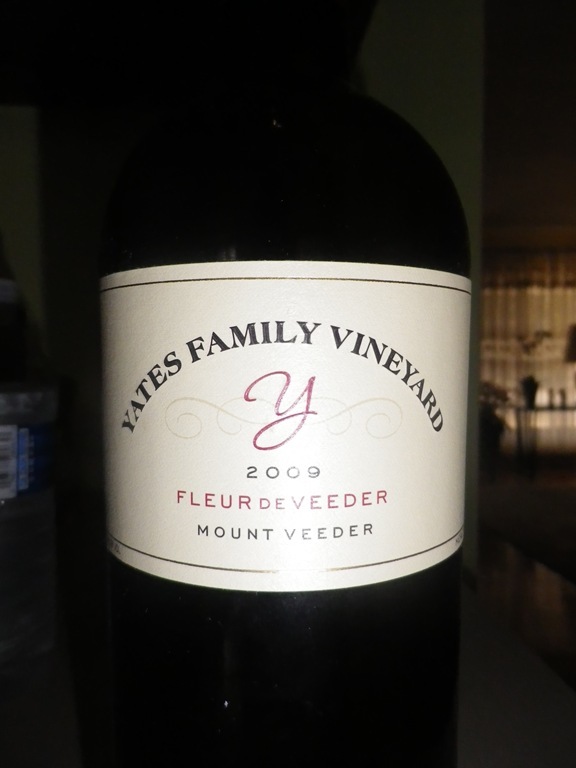 Yates Family Vineyard-Fleur De Veeder-Merlot-Mount Veeder-California-2009-14.7% Alcohol-$37.00-A nose of sweet dark fruit and spice, dark purple in color. A full bodied, delicious Merlot, yes it’s a Merlot, 100%, cassis, raspberry, velvet favors, mocha, a very long finish. Search out this winery, had a private tasting last year with Michael and Whitney Yates, great family, great wine. NR CR-92 Good with meats, chicken, pasta.